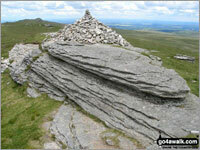 Dartmoor National Park is the area within the Datrmoor National Park boundary. Dartmoor National Park is in South West England in the county of Devon. Situated in the south west of England, Dartmoor is a landscape of wild moorland covering 954 km² (368 sq mi). The upper moorland areas are capped with many exposed granite hilltops known as 'tors' and the entire area is rich in antiquities and archaeology. The stunning views, deep wooded valleys with fast flowing rivers, rugged, wide open spaces and numerous prehistoric standing stones, stone circles, kistvaens, cairns and stone rows provide a superb place to walk and hike. The principal settlements are Ashburton, Buckfastleigh, Moretonhampstead, Princetown, Yelverton, Horrabridge, South Brent, Christow, and Chagford. Wild Camping is legal on Dartmoor with lightweight tents you can carry in a backpack, there are restrictions on where you can and can't camp and some basic rules to follow. Downloadable Peak Baggers Map you can Print or Save to your Phone detailing all the Mountains, Hewitts, Deweys, Nuttalls, Marilyns, Bridgets, Hills, Peaks and Tops in Dartmoor National Park. 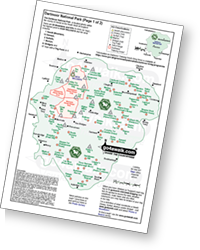 Downloadable Peak Baggers Map and Tick List# you can download and print or save to your phone detailing all the Mountains, Hewitts, Deweys, Nuttalls, Marilyns, Bridgets, Hills, Peaks and Tops in the Dartmoor National Park.